Lately, Bennie Rosato has her eye focused firmly on the bottom line, especially since she has three dedicated young associates and a very pregnant secretary on her payroll; so she takes a professional risk, charging into a class action lawsuit that could make, or break, her career. Then her wallet goes missing. And Bennie's life goes crazy. When events escalate into murder, the maverick lawyer realizes that the stakes are far greater than she feared. But Bennie Rosato refuses to be anyone's victim. To find the killer, she'll plunge headfirst into a life-and-death investigation that will bring her face to face with an evil darker, yet more familiar, than anything before. ©2003 Lisa Scottoline (P)2003 HarperCollins Publishers, Inc.
A very good read! I have read all the Lisa Scottoline novels available in audio and I think they are wonderful! This book is no exception! Events which may or may not be related combine to create a complex and suspenseful tale of treachery and greed capped off with friendships old and new both growing and maturing as the characters grow and change. I think the reader is wonderful for this series! She does beautifully with the different dialects and languages and makes each character seem unique and individual! All in all very enjoyable! I love that Scottoline moves from character to character in her novels, giving each of her Philadelphia attorneys a chance to shine. Danger, a hint of romance, and lots of likeable characters, some of whom actually experienced growth drew me into the story. Rosenblat gives a good read, and this mystery just didn't seem long enough--I didn't want this treat to end so soon. You may be thinking what I was thinking. Who would use such an ancient (and silly) plot device??? Scottoline only uses her 'evil twin' as one thread of of many different plot strands to keep you thrilled. So *don't worry* the entire book is NOT only about an evil twin ruining her life. The biggest one being "My firm is going bankrupt!" (That twin girl is NOT helping!) she might add for a laugh. This writer does drama, law, and humor. You learn a bit of law, *laugh at the MANY comic thoughts that cross her character's lips or minds*. See above or another idea: about a "cursing diet." I've yet to listen to a Scottoline / Rosenblatt read book that was not a winning combination. Again, the author is not intending to win a Pulitzer but she does know how to entertain and she can actually make lawyers seem warm, fuzzy, and caring. Now THAT is a a difficult writing task at which she always succeeds. Lisa Scottoline always captures my interest from the very beginning and entertains me all the way through! An excellent addition to her collection! Disliked: The childish behavior of Rosatto. The end comes in a very bad plot way. I was on the end of my seat so many times! I enjoyed it immensely!!!! 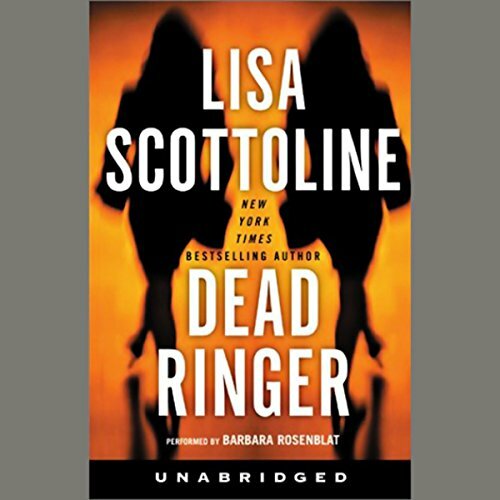 Where does Dead Ringer rank among all the audiobooks you’ve listened to so far? I love Lisa Scottoline stories, they captivate me. Her stories make me keep coming back for more. loved it. I feel like I know these women. I can't stop reading about them and their cases. Rosenblat makes the whole story come alive. She does all the accents and voices tremendously!